Summertime is almost here, so it’s time to stock up on sunscreen (though you should be wearing it all year round)! But don’t forget to toss a bottle of dog friendly sunscreen in your shopping basket for your four-legged friend, because humans aren’t the only ones who are at risk for sunburn. Most pups have built-in protection from the sun in the form of their fur, but not all dogs have enough fur to keep them safe from sunburn, and all dogs can get sunburn if they’re out in the sun for long enough, as Cesar’s Way, the official website of Cesar Milan, points out. If your dog has natural bald spots, or is losing his or her coat, it’s very important to make sure that your pup has the sunscreen needed every time they go outside. To choose the right sunscreen, talk with your vet. If you’re unable to find sunscreen specifically for dogs, you can use a sunscreen for sensitive skin, like one that’s safe to use on babies – human babies, that is. These sunscreen varieties are also generally free of zinc oxide – a common sunscreen ingredient that can be toxic if your pup eats it. Just like when you’re trying a new skincare product, test a bit of the sunscreen on your pup to make sure he or she doesn’t have an allergic reaction. If there’s no irritation after about 24 hours, you’ve made a good choice. Of course, the best defense is allowing your dog to keep a natural coat – not to thick, as to prevent overheating, but not so close a trim that the fur cannot block the harmful UV rays. Don’t forget that having available shade is important too – not only to block the sun, but to provide a cool place for pups to rest their paws. You know how hot beach sand and blacktop can get in the summer sun, and while you have the advantage of shoes, your dog doesn’t! Prevention is key, as pups can suffer from painful sunburns that can seriously damage their sensitive skin, especially areas like their noses and ears. Plus, more exposure to the sun could increase your dog’s risk of cancer. A good rule of thumb – if you’re applying sunscreen to yourself and your kids, that’s a sign that you should rub some on the dog, too! Looking to grow your family this summer? 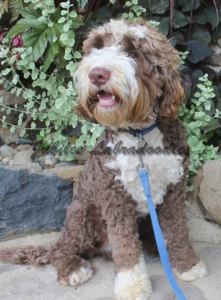 At Jubilee Labradoodles, we have beautiful labradoodles and goldendoodles that are sure to become loved members of your family. To learn more or to inquire about upcoming labradoodle puppies or goldendoodle puppies, call us today at 517-467-6811 or 517-902-9808.